It is amazing how much happens in a year or even a few months! I want to share a few pictures that were taken when Fox 21 reporter Joe Gagnon andSummer (the camera lady) met us for “live” broadcasting and 8 interviews! My son Ronald and I enjoyed meeting with Joe and his wife Summer and introducing them to some of our rabbits that we raise here at Garden Gate Rabbit Park. Yes, we were excited! 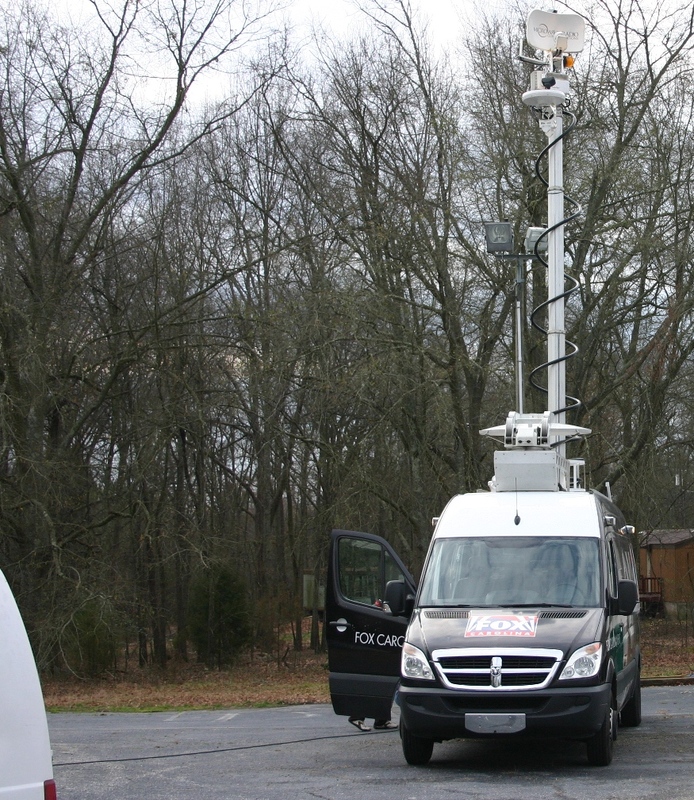 The Fox21 van was parked and the satellite equipment mounted on top was extended during the setup. I set up my camera off to the side on a tripod to get some photos made between each broadcasting. My photos show details not included in the filming made by the TV camera that Summer was using. 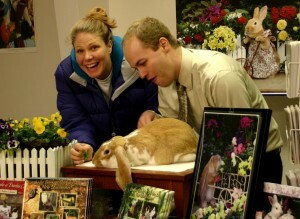 Our rabbits were very entertaining and Mindy one of our English Lop rabbits is posing in front of Joe. He really enjoyed the rabbits whether we were “on the air” or off! 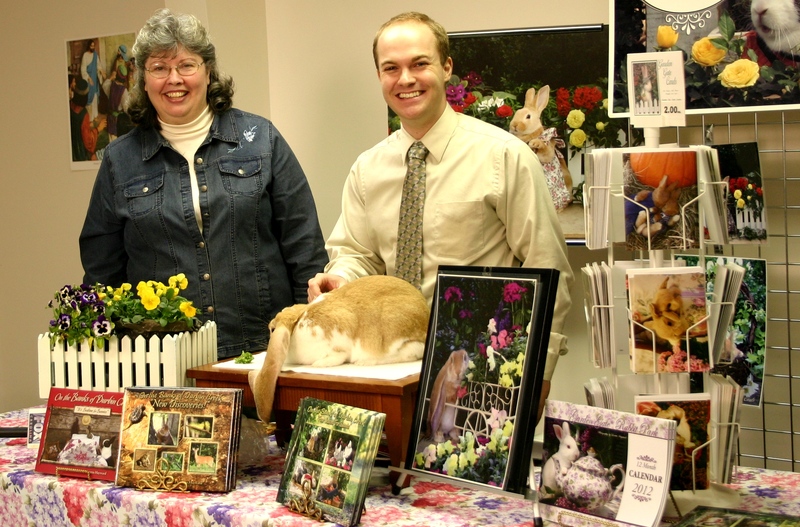 Summer and Joe meet Mindy our English Lop. Summer and Joe liked feeding the rabbits as you can see and met six of our rabbits that were different breeds. They saw firsthand how much our bunnies liked all the special attention as well as the fresh violets that the rabbits enjoyed nibbling every opportunity that they could get! Ronald introduces Spike our Flemish Giant. 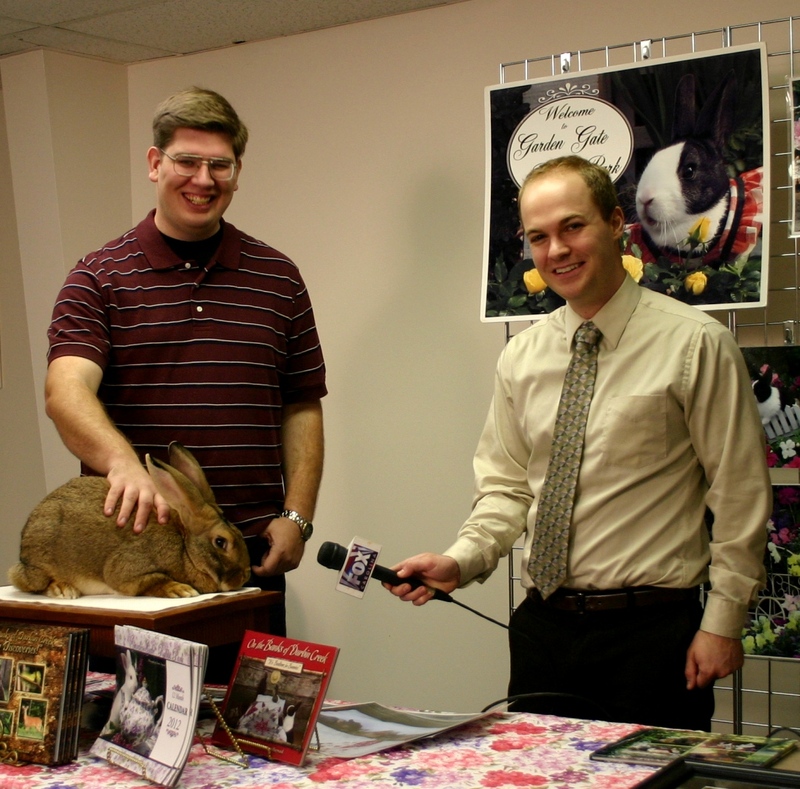 Ronald told about our Flemish Giants and Spike is posing in the picture waiting for his turn to talk “on the air” as Joe holds the mic. Spike would have been much more interested if the mic was edible! We enjoy sharing with people news, various humorous experiences we have had raising rabbits, our extraordinary work raising different rabbit breeds and dressing the bunnies for picture taking time. The various events we attend give people time to meet a lot of rabbits. A variety of information is shared through our educational programs, various slideshows and presentations! These unforgettable experiences make lifelong impressions! Cherishing Roses The LOVE of Books!